I rant my Clownface colleague, again! This is another rantblog that I am making on my Clownface colleague, whose face still looks like a clown to whoever that looks at it. I had earlier made a rantblog on Clownface late last year, and now I feel that more needs to be ranted on this spectacular failure of a human being. Even when he engages in a simple conversation, Clownface fails to show the basic fundamental respect to whoever he is talking to. Once, Clownface wore a new pair of pants to work, and when I asked on what was the colour of his pants, Clownface replied, “Oh, if you think it’s grey, it is grey. If you think it’s brown, it is brown.” Simply put, Clownface either refuses, or is unable to give a direct answer to anyone, it is as though he is going to lose out a lot by doing so. Just the other day during lunch, some of my colleagues were discussing about an upcoming hiking trip to Malaysia, and Clownface decided to pull a prank on someone by saying that the hike involved staying overnight in the wild jungle, when this was simply not true as it was already made known that hostel accomodation would be provided. Clownface was obviously preying on the innocence or naiviety of my colleague, which I find most disgusting. Again, Clownface has little to no respect to even the colleagues that he works closely with, often mocking the ways his fellow colleagues laugh or talk. And Clownface makes some the most disrespectful and offending jokes that would have been insulting to an honourable person. When it was announced that one of the female office colleagues was getting married, Clownface commented on whether is she even physically developed enough to get married, alluding to her small petite figure. This was followed by his trademark out-of-breath laugh. I have no doubt that this remark would have been insulting to anyone who is getting married soon. There is no end to Clownface’s disdain towards company policies. When the company recently gave out company polo shirts to promote comraderie, Clownface thinks that the whole thing is a joke, and that the company should have given out shopping vouchers instead, or something that he can use at the company’s expense. In recent weeks, the company had adjusted its leave allocation scheme to bring it in line with the standard business practice, which I felt was a good thing. Rather, Clownface made a big fuss out of it, as the new scheme resulted in one less day of annual leave for some employees, including him and me. Clownface even remarked that the company was “depriving its employees of their rightful leave entitlement”. As for me, I am not going to lose too much sleep over just one lost day of leave, especially now that the company is in line with the standard business practice, which is actually beneficial to all employees in the long run. In any adjustments like these it is expected that some win and some lose out. And besides, one can simply ask the boss for one more day off, and the boss can quite easily grant it at his discretion. But what is most despicable about Clownface is that he can actually consider some of the most tragic events as amusing. On at least two occassions, Clownface commented on some news articles that he had read, the first on an assault case on a tourist who went alone by himself on a tour in Taiwan. Clownface said that the tourist should have been much more careful. The second article was about a series of vicious attacks in Europe, which Clownface thought of as funny that they could have even happened. Anyway, in both cases, Clownface was laughing himself out of his breath, as though there was something funny about these attacks. This is where I draw the line. As compared to Clownface, I do not derive pleasure from the pain of others. The fact that Clownface finds these incidents funny can only mean that there is something perverse in the way Clownface finds his amusement. And these incidents had made me realise that Clownface is simply too dangerous a person to talk to. He can just twist whatever that had been just said and turn it into a derogatory remark, something that had already happened on numerous occassions with some of my colleagues. Therefore, I’ve decided to avoid any interaction with Clownface, and not to talk to Clownface unless it is something absolutely urgent, just in case he uses what I have said against me. This has to be done, least Clownface be able to find some ammunition to mock the people around him, or even mock me. In the past month or two, I had been joining a group of triathlon enthusiaists to exercise after work on Monday evenings. Actually, I was invited by my colleague Yo-yo Girl to join in the training. She herself is a triathlon enthusiast, having participated in many events. Personally, I jog and workout in gym often, so to do some triathlon training so happens to coincide with my personal resolution of staying fit and healthy and making exercise part of my everyday life, and perhaps even hulking up my physique so as to raise my market value. Triathlon events consist of swimming, cycling and running. It can be a rather expensive hobby since triathletes invest quite a lot of money in purchasing and maintaining a good racer bike, usually in the range of $2,000 or $3,000 plus. Furthermore, some triathlon training programs conducted by professionals can cost in the hundreds. Fortunately, these Monday trainings are conducted by a fellow triahlon enthusiaist who offer his coaching services for free. 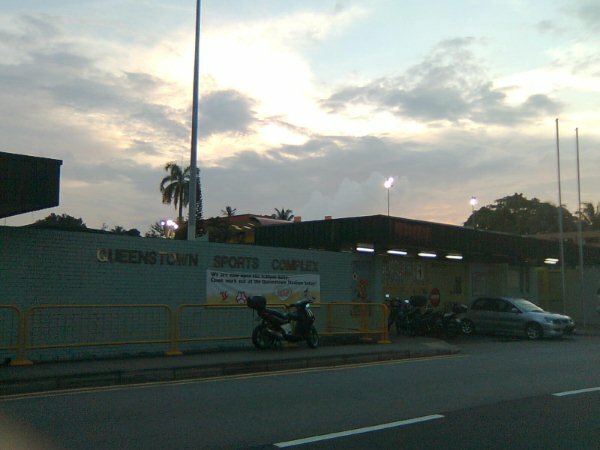 I train at the Queenstown Sports Complex, there is a swimming pool there which was built in 1970. The training only involves swimming and running, no cycling. First, we would swim 30 laps, which translates to 1.5km. After that, we would change into running attire, and run around the Queenstown area twice, ending back at the sports complex. I estimate the total running distance is about 6.3km. Ideally, a triathlete should be able to complete 30 laps of swimming within 40mins, something that I have yet to achieve. Running immediately after swimming simulates the triathlon or even biathlon events, allowing us to adapt to the racing conditions, as well as develop the stamina to run some more after having first tiring ourselves out with swimming. I had taken part in some triathlon/biathlon events. In my first event, I was part of a triathlon relay team, doing the 10km cycling part. My second event was a mini-biathlon, while my latest event was a sprint triathlon, which has half the distance of a full-length triathlon. I have not participated in a full-length triathlon yet, since I am more interested in doing the shorter distance races that I am confident of finishing.